I’m sure if you’d asked Michal Kwiatkowski that morning he wouldn’t have thought it either. Movistar rider and Essex boy Alex Dowsett delighted the home crowds yesterday when he took the lead from the clutches of Omega Pharma Quick-Step’s Kwiatkowski after a powerful and smart ride in the day’s breakaway. 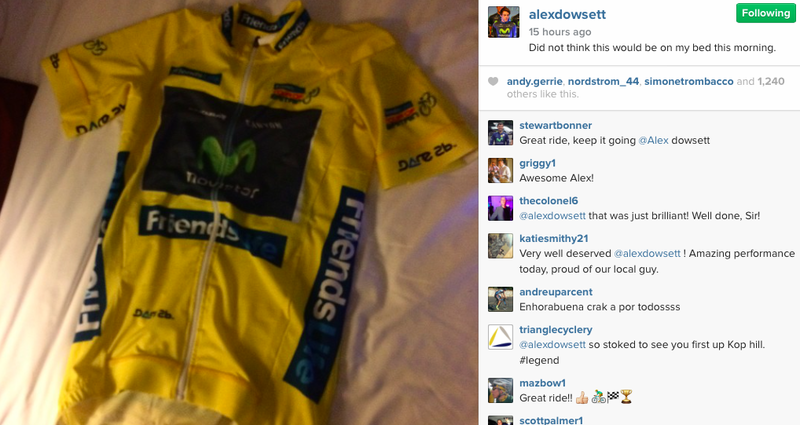 What happened to Kwiatkowski’s yellow jersey? Was it a miscalculation of how much Dowsett and the breakaway could threaten the peloton? Was it sore legs, team communication, the peloton dragging their heels? One thing came to mind as OPQS pedalled like mad into Hemel Hempstead: panic. Everyone in the team put their bodies on the line in the last few kilometres – whatever game plan they had in pieces as Dowsett, Brändle and Stewart crossed the line. “I think when Juan Pablo (Molinero, Movistar DS) came up and told me to calm down a little bit, I was running on anger,” Dowsett told Cycling Weekly. So a British lad stood on the podium that evening to take the yellow jersey. The home-nation fans had always wanted that, even expected it in the initial stages, but when it finally came it was a different Brit than expected. You’d be hard pressed to find much talk of Bradley Wiggins at all these days in the Tour. He’s slipped, quietly, into the background. Yesterday was golden though for Dowsett and for British cycling. For Kwiatkowski the shine has rather gone from the Tour. But Dowsett only has a 34 second lead on GC, and tomorrow he faces a huge test. Movistar will have to work hard to neutralise Nicolas Roche and Michal Kwiatkowski on the climbs. Whatever happens today, the final stage going into London tomorrow will be an interesting affair round the capital city.